1. At any bloggers meet, don’t sit way at the back if you want to win goodies be more interactive at the event. Just to give you an idea, this is where I was sitting. 2. Nokia has come with some truly innovative, mind boggling apps. The evening started with a few blogger introductions, where bloggers were called on stage and asked point blank to choose between being a techie or a foodie. Gadget Guru Rajiv Makhni and Michelin Starred Chef Vikas Khanna, the hosts of the evening kept the audience in splits throughout. 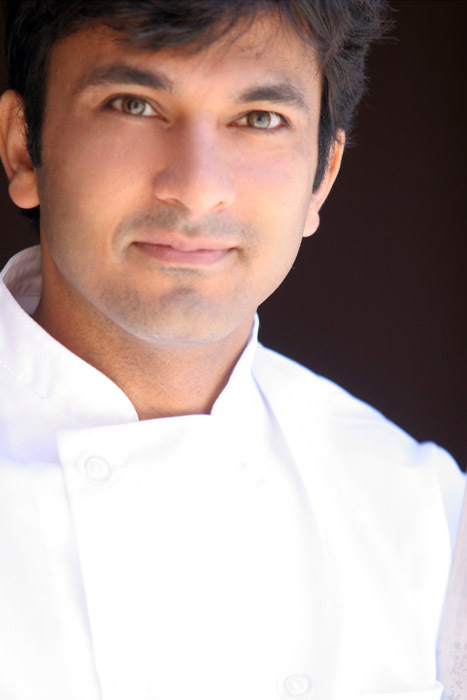 While Vikas Khanna taught us a French technique of chopping onions, Rajiv Makhni introduced us to Nokia apps like Food and wine pairing,Alcohol Meter,Silent film Director,Photo merging app and Morpho. My favourite app, out the ones showcased was “Nokia City lens”, which displays the details of the nearest establishments through your camera’s display . Locate your destination, your way. 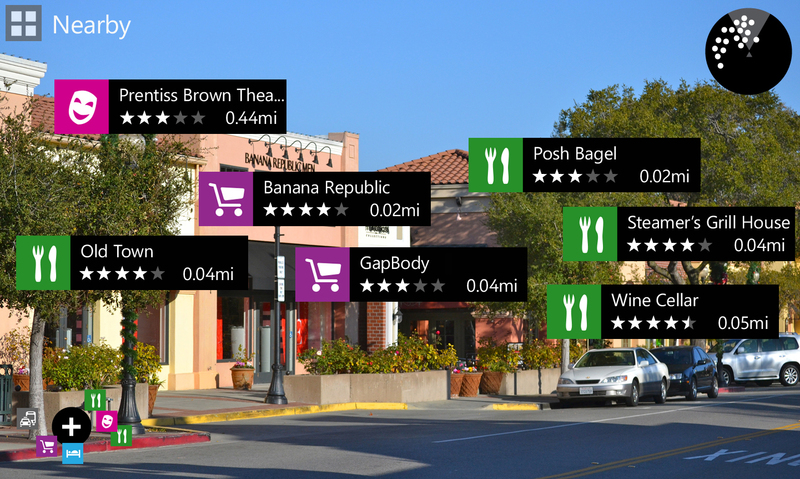 See what’s nearby the way that works best for you—whether through a camera view, list view, or maps view—including landmarks, restaurants, hotels, shops and more. There is something about Vikas Khanna that gets the ladies smitten, including me. The Michelin starred chef, has been voted as the hottest chef in New York and one of People Magazine’s sexiest men alive.. Be it his grounded personality, soft spoken nature, adorable chuckle or the ease with which he states some profound account of his life, I have always been in awe of him. Vikas Khanna, "a young Punjabi boy, who landed up on the streets of New York penniless”* is an inspiration to all who want to follow their passion, but have nothing more than their dreams to start with. And I feel extremely grateful that I got to meet him! The youngest person to attend the event, adorable Adina! Congratulations to the Indiblogger team for completing 5 years! May you host such fun-filled, successful blog events till the day of apocalypse forever!! P.S. It was great to meet and catch up with blogger friends Desh,Arshita,Deepak,Neha Hadkar,Neha Thakkar,Varsha,Priyanka!! P.P.S. Rajiv Makhni forgot to complete Vikas's story about Angry Birds. *Statement taken from "Teacher's Achievement Awards Present Achievers' Club"
So are you a foodie or a techie? Any suggestions for such blogger event? Excellent recapture of a glorious evening at Lands End.. evocative thoughts ..and great textual tapestry.. keep it up..
Lol.. Seems like you were one of the back-benchers too. An evening very well described, complimented with excellent pics to visualize the event for the unfortunate ones who couldn't make it! The one thing that is pulling me towards Nokia is 'Nokia City lens'!! What an app! Oh you couldn't make it? Never mind, hope to meet you at the next event :) Nokia City lens is indeed an impressive app! Agree with you on the first point! Couldn't agree more about Vikas Khanna being the heartthrob at the event. Wonderful account. Keep blogging! Wow! Looks like you enjoyed a lot! And Adina is cute!!! OOOOOOhhhhh!!! Vikas Khanna is a heart throb! A lucrative way to express Nokia Event in India.